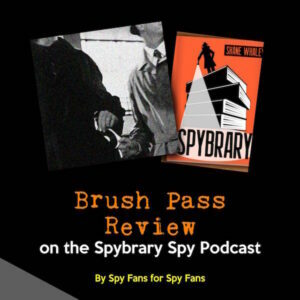 Tune in to episode 27 of the Spybrary Podcast and hear what Spybrarian Jeff Quest (the man behind the epic Spywrite blog) has to say about The Exphoria Code and why you might want to give it a go. What is The Exphoria Code all about then? Brigitte Sharp, a cyber-espionage specialist with MI6, has been deskbound and in therapy for three years, after her first field mission in Syria went disastrously wrong. But now one of her best friends has been murdered, and Bridge believes his death is connected to strange posts appearing on the internet, carrying encrypted hidden messages. When Bridge decodes the messages, she discovers evidence of a mole inside a top-secret Anglo-French military drone project. Her MI6 bosses force her back into the field, sending her undercover in France to find and expose the mole… who may also be her friend’s killer. But the truth behind the Exphoria code is worse than she could have imagined. Soon she’s on the run, desperate and alone – as a nuclear terrorist plot unfolds and threatens everything Bridge has left to live for. Sounds intriguing, so who is Antony Johnston? Antony Johnston is a New York Times bestselling graphic novelist, author, and games writer with more than fifty published titles. The Charlize Theron movie ATOMIC BLONDE is based on his graphic novel THE COLDEST CITY. His epic series WASTELAND is one of only a handful of such longform achievements in comics. His first video game, DEAD SPACE, redefined a genre. 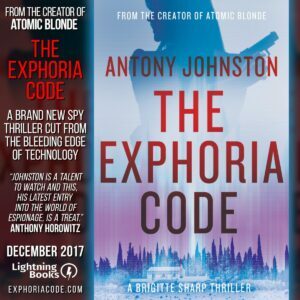 Antony’s other books and graphic novels include THE EXPHORIA CODE, THE FUSE, DAREDEVIL, JULIUS, the ALEX RIDER graphic novels, DEAD SPACE transmedia comics, and the adaptation of Alan Moore’s ‘lost screenplay’ FASHION BEAST. What is a Brush Pass review exactly?